If you like durians, now is a good time to indulge, as prices of the fruit have been slashed by 50 per cent - or even lower - in some cases. Heavier rainfall in May and June in Malaysia, the main source of durians here, has led to a greater supply and a drop in prices. A popular variety like Mao Shan Wang (Musang King) sells for as little as $15 per kg at some stalls here, down from a high of $35 or more per kg last month. Prices of non-premium durian varieties like the D101 or D13, which earlier averaged around $13 per kg, also dropped to below $10 per kg. Durian sellers told The Straits Times that their business has picked up in the past week, with their stocks selling out faster. At Ah Seng Durian, a stall in Ghim Moh Market, daily supplies of Mao Shan Wang durians are often fully reserved by the early part of the day and long queues can be spotted daily outside its stall. Likewise, 717 Trading in Yio Chu Kang has been enjoying brisk durian sales. Many customers were seen carrying the fruit home in large paper bags, even after enjoying them at the stall. Mr Goh Kwee Leng, 65, owner of 717 Trading, said: "Previously, customers were buying, maybe, one or two durians. Now, they are buying seven to ten." 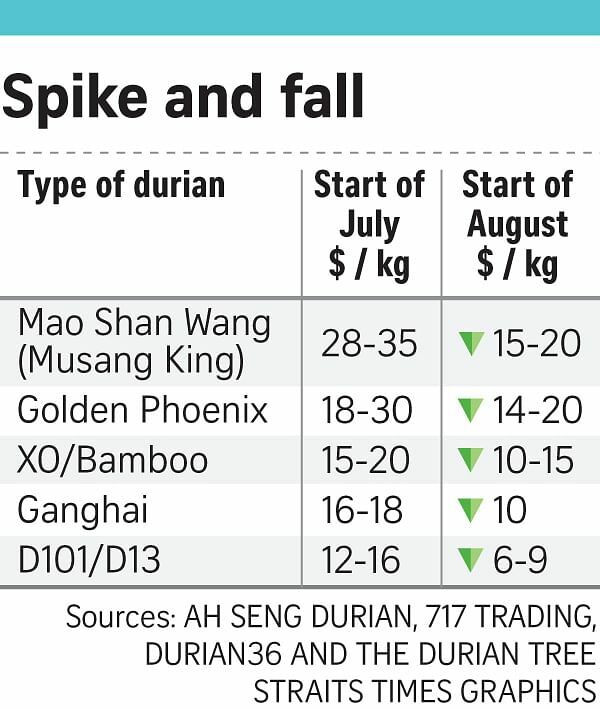 Prices for durians had risen as a result of a poor harvest caused by a brutal drought in April. Ms Alice Ng, a teacher, was spotted outside Ah Seng Durian on Tuesday, where she and a friend had just bought five Mao Shan Wang durians for $99. This was a bargain, compared with the $60 that the 33-year-old had paid for just one such durian about three weeks back. She said: "It was a large durian, but it wasn't as good as those in peak season. A durian seller then told me that in August, the durians would be nicer." Other fans of the thorny fruit had waited patiently for prices to drop. Ms Donna Oh, a 45-year-old sales supervisor who was at 717 Trading with her friends on Tuesday, said: "I didn't eat durians when the price was high and I waited. I heard that the durians around this season taste better anyway." Sellers from The Durian Tree, a shop in Bukit Batok, echoed this sentiment, adding that durians harvested recently taste better than those harvested earlier. Last year, Singapore imported about 21,200 tonnes of durians, said the Agri-Food and Veterinary Authority. There is more good news for durian lovers. Mr Peter Saw, 36, a seller from Delight Fruit in Sims Avenue, said prices are likely to drop even further as a bigger supply is expected in the next two weeks. Referring to how durians drop to the ground after becoming ripe, he said: "Durians are going to experience a 'big drop' soon, so prices will probably fall again."